Let the stress role away as you relax and rejuvenate in one of our three tranquil spas. Our world-class therapists melt your knots and tension away with their experienced hands. From refreshing facials to our signature Pa Sak Tong Thai Massage, you’ll leave feeling completely revitalised and refreshed. Our therapists are also trained in a variety of therapies to assist in the repair of damaged tissue and relieve troubling aches and pains. In keeping with our natural approach, all products and oils for massage, facials, and body treatments is 100% organic and chemical-free. Our team designed specific applications using these exceptional face and body products to regenerate and replenish your skin. The Spa Pavilion is an outdoor spa with an amazing panorama view of the entire estate. The Spa is fully equipped with a steam and outdoor treatment room. This is a wonderful location to have a traditional Thai massage and enjoy the view of the rice fields and buffalo feeding below. The Paradise Spa comes complete with both steam, scrub and a treatment room for two. The spa has both indoor and outdoor facilities for treatments. Enjoy a relaxing herbal steam followed by a plunge in our unique deep stone bath in total privacy next to cascading waterfalls. Located within the villa of Pa Sak Tong, the Teak Spa provides the perfect way to relax after a long day of sightseeing. Set up for couples this spa has everything you need to unwind. The Teak spa also has a herbal steam room. "You won’t find anything else like this - unique and unmatchable!" 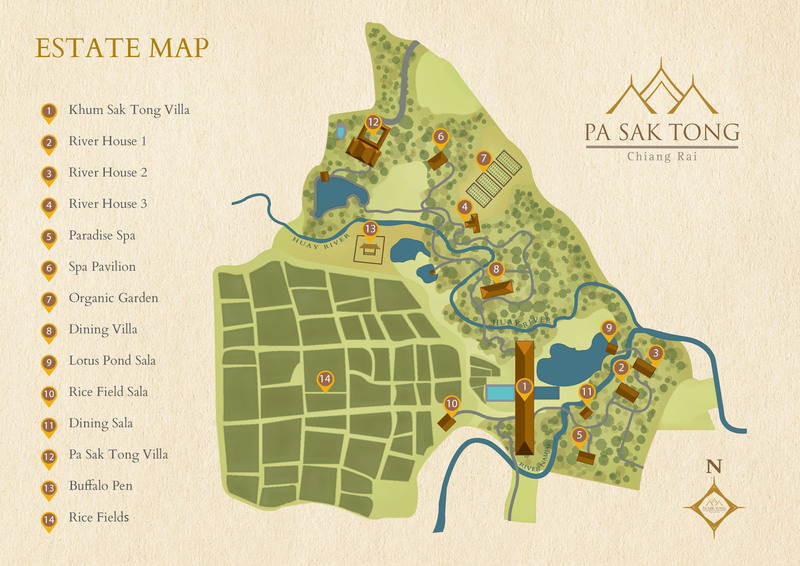 Treat your family to the most relaxing destination villa in Northern Thailand.